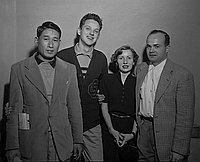 Table tennis player Konko Sai and a Caucasian couple, Mr. and Mrs. Bob Edwards, and young man, Robert Ashley, stand facing the viewer after a ping pong practice in preparation for a California student ping pong tournament to be held at Evergreen Stadium, California, November 20, 1950. Sai, left, wears a jacket with a newspaper tucked in proper right pocket. 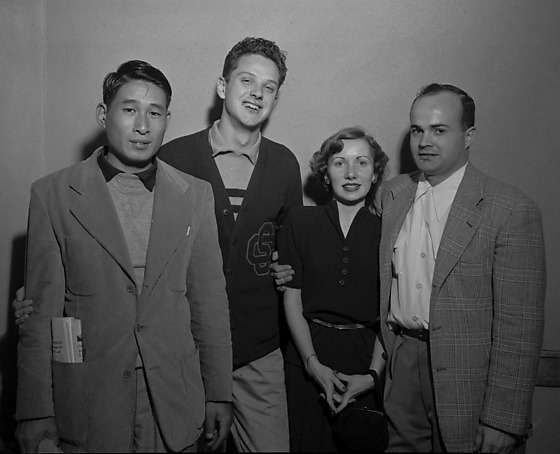 Ashley, second from left, wears a University of Southern California letterman's sweater, "SC". Bob and wife stand at right. Written on original negative envelope: Ping Pong.